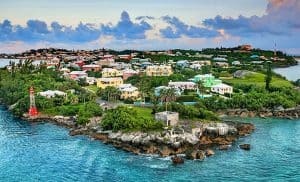 Arriving at the West End of Bermuda, we are amazed and delighted by the landscape here in one of the most rugged parts of the island. Huge dramatic rock formations rising like a phoenix from the sparkling, turquoise water. At waters edge, the gleaming white, tiered roofs in contrast to the distinctive pink buildings of The Reefs Resort appear like a welcoming vision. The original property was built around the ruins of a 1680’s farmhouse at Christian Bay, Southampton and first owned by Marmaduke Dando (not the current crooner of morose ballads). 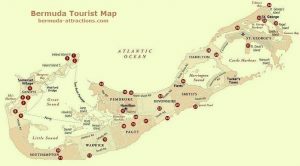 Over the years, the property changed hands and in 1947 the hotel became known as The Reefs Beach Club, This was the first cabana-style beach resort in Bermuda. Then In the early 1970s and mid-1980s, the cabana-style resort was demolished and replaced by new guest accommodations and since then ongoing renovations have taken place. Entering The Reefs, we’re thrilled by the spectacular beauty and exotic surroundings with its bright, tropical plants and wide vistas, overlooking the ocean. From the very beginning, the staff provided friendly, personable service and guests who are treated like family, according to General Manager, David Dodwell, Jr.
To create an intimate, welcoming experience, a guest card is displayed with the names of couples who are celebrating special occasions, including birthdays and anniversaries. Recognition is also given to first time visitors as well as to couples returning many times. This attention to detail creates a sense of belonging and well-being that is we felt throughout our stay. As first-time guests, we explored the resort’s rocky cliffs and wandered to the very tip of the property to watch the pounding surf against the rocks from a deck that overlooks the ocean at Caso’s Point. This spot is named after a guest, Larry Caso, who visited the property 126 times and spent his time relaxing and fishing off the rocks. Now this wild spectacular setting provides a romantic backdrop for many engagements and wedding ceremonies that are performed at the resort. Inside the nautical decor enhances the bright, spacious public rooms and in the luxurious guest suites and rooms. The private balconies provide breathtaking views of the surrounding reefs and beach. Our junior suite was tastefully designed including an open-design space with a rainwater shower and a deep, soaking tub. Outdoors, under lofty trees, , we discovered a pair of hammocks to lazily occupy. an opportunity to mingle with other guests. A few hours later, there was a delightful swizzle cocktails reception on the open terrace. The sunset over the ocean provided a perfect backdrop to a special evening of conversation and conviviality. Dinner that night was served at the Coconuts restaurant overlooking the beach. The Executive Chef Nick came over to personally recommend the fresh, red grouper caught that day. We dined al fresco in full view of the ocean feasting on other delicacies from the sea. The soft lights with water views created a romantic setting. a most enjoyable and unexpected surprise. A beautifully birthday cake with chocolate-dipped strawberries. 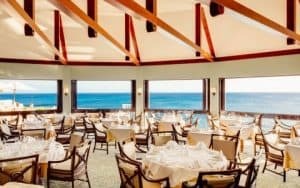 Another evening, we dined on smoked salmon and wild, red snapper at the Aqua Terra restaurant in it’s elegant setting with views of the expansive ocean waters. 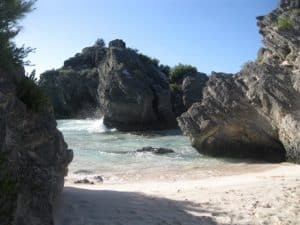 After a sumptuous, gourmet breakfast of Bermuda Codfish we felt energized to engage in water sports on the private beach. For exploring the reefs, we opted to snorkel in the protective environment of the coral. We saw clown fish, spot tail, blue parrot fish, and a variety of exotic, iridescent fish in all shapes and sizes. 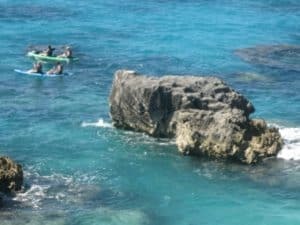 Other guests took kayaks to explore the reefs and the volcanic rock surroundings. While some enjoyed a leisurely dip in the clear, blue waters others headed for the infinity pool overlooking the ocean. During our stay, the staff arranged our time to play tennis and enjoy spa treatments. On other days, they were helpful in planning our visit to the Royal Naval Dockyard and a shopping trip into Hamilton. It was a great pleasure being pampered with high-level, personalized service and the undivided, unhurried attention, by the Reef’s professional staff. It was always our choice to be actively engaged or to just savor the moment and feel the dream come alive surrounded by the beautiful beach and water views.